Brexit Secretary David Davis has called on both sides in the negotiations on the UK’s departure from the European Union to “get down to business”. Mr Davis is in Brussels for a second round of formal talks on Brexit. He said his priority was to “lift the uncertainty” for EU citizens living in the UK and Britons living in the EU. The EU says there must be substantial progress on this – and on a financial settlement and the issue of the Irish border – before trade talks can begin. The meeting comes after Chancellor Philip Hammond told the BBC’s Andrew Marr Show that businesses were holding off from investing in the UK because of uncertainty about Brexit. Reality Check: Will the UK pay a 60bn ‘divorce bill’? Earlier this month, Theresa May’s offer to give the three million EU citizens in the UK “settled status” after Brexit was immediately dismissed by European Council President Donald Tusk as “below our expectations”. And Michel Barnier, the European Commission’s chief Brexit negotiator, has said there are still major differences between the EU and UK on the rights of EU citizens living in Britain. The call to “get down to business” from David Davis is meant to signal that the Brexit talks are entering a serious phase after an opening session of pleasantries and procedural discussions. That might raise eyebrows on the European side where there’s a perception that Britain dithered for months after the Brexit referendum before getting down to talks. 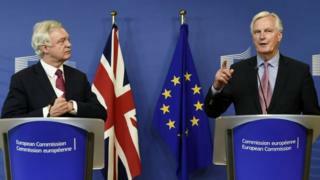 The UK says it’s prioritising the issue of mutual citizens rights after its opening proposals received a lukewarm response in Brussels. The atmosphere around this second round of talks may have been improved a little by a government acknowledgement that the UK has obligations to the EU which will survive withdrawal and which need to be resolved. After a previous suggestion from Foreign Secretary Boris Johnson that the EU could “whistle” for its money that more conciliatory suggestion was buried in a written parliamentary answer – but it was noted in Brussels. Europe’s traditionally lengthy summer recess will be punctuated by rounds of talks this month and in August – a reminder that the stakes in all of this are high and the timeframe uncomfortably tight. Mr Barnier has said that citizen rights – along with the “divorce payment” and border issues – must be dealt with before future UK-EU trade could be discussed. The financial payment the EU says will be owed to cover the UK’s commitments is also a key point for Mr Barnier. Estimates have put the amount at anywhere from 60bn to 100bn (53-89bn). But in the Commons, Foreign Secretary Boris Johnson has said that Brussels could “go whistle” if it expected the UK to pay a hefty “divorce bill”. Talks are expected to continue to Thursday.